1. Birds of Hilbre Island. 2. Wildlife on and around Hilbre Island. 3. Hilbre Islands' Status as a Nature Reserve. 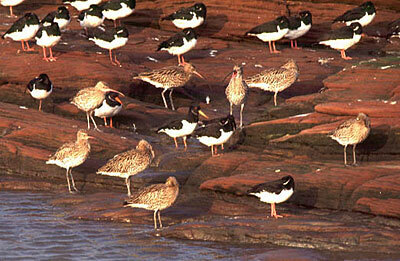 Curlews and Oystercatchers roosting on the red sandstone of Hilbre Island. The most obvious group of birds to be seen from Hilbre for most of the year are the waders. Hundreds feed on the seaweed covered rocks around Hilbre at low tide with peak numbers during the winter. One to catch the eye is the Oystercatcher with it’s striking black and white plumage and bright red bill. Much more rare is the Purple Sandpiper, a Hilbre speciality with up to 50 wintering on the island. They can be hard to spot as they are well camouflaged foraging around the seaweed covered rocks. Waders also use the three Hilbre Islands as high tide roosts where they can rest, hopefully in peace, for a couple of hours. Both Little Eye and Middle Eye hold hundreds of Oystercatchers and Curlew. The roosts at West Kirby and Hoylake can be seen from the islands, here many thousands of Dunlin and Knot spend high tide. Other estuary birds include the Shelduck, a colourful duck which spends low tide feeding on the mud of the estuary and at high tide many can be seen swimming around Little Eye. 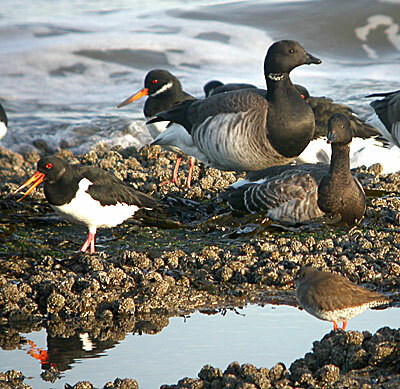 Another Hilbre speciality is the Brent Goose and up to 50 overwinter on the islands. More often than not they can be observed on the rocks on the north end of the main island at low tide but at high tide they prefer either Little Eye or they fly further in to the estuary. Brent Geese, Oystercatchers and a Redshank on the north end of Hilbre. Hilbre is nationally famed as one of the best sites in the country to see Leach’s Storm Petrel. This is a small ocean going bird which during it’s southward migration in Autumn can get blown in to the Irish Sea by westerly gales and end up off the mouth of the river Mersey where they battle against the wind to make it back out to sea by flying past Hilbre. Late summer sees a large post breeding gathering of Sandwich, Common and Little Terns. These graceful birds fill the air with their strident calls for several months before making their way south for the winter. Other regular sea birds are Gannets, Manx Shearwaters, Little Gulls, all four species of Skuas and a good selection of sea ducks, divers and grebes. Lying out to sea Hilbre Island acts as a magnet to any land bird flying along the coast or may be taking a short cut across Liverpool Bay. Virtually anything can turn up but some of the more regular visitors are Meadow Pipits, Willow Warblers, Swallows and Wheatears. Many birds which we don’t normally think of as migrants can travel tens or even hundreds of miles during spring and autumn. Birds such as Robins, Blackbirds, Chaffinches, Green Finches and even tiny Goldcrests are seen flying in from the Irish Sea, many of these are trapped and ringed by members of the Hilbre Bird Observatory before being safely released. The Hilbre Islands are largely free of ground predators and this means the population of breeding birds is more dense relative to the mainland. Typically about ten species breed on the islands with Shelduck, Meadow Pipits and Linnets being the most common, each with about 10 to 15 nests. Linnets are on the Red Data list so are of particular importance to Hilbre. Mallard, Skylark, Pied Wagtail, Wren, Robin and Carrion Crow also breed regularly. 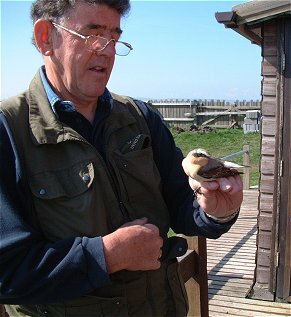 The Hilbre Bird Observatory was established in 1957 to monitor all these birds. Whenever the Observatory is manned (typically 210 to 230 days a year) a full list of both the species seen and numbers is made. Many of the birds which pass through the islands are caught in the traps set by the Observatory members. The birds are measured, weighed and ringed before being released safely. The information gathered by the Observatory is used to study bird population trends and migration patterns, a Hilbre Bird Report is produced annually. Over the years a good number of rarities have been seen (and sometimes caught) by members of the Observatory. These include Little Shearwater, Surf Scoter, Laughing Gull, Gull-billed Tern, White-winged Black Tern, Bee-eater, Red-rumped Swallow, Red-throated Diver, Sub-alpine Warbler, Pallas’s Warbler and Woodchat Shrike. For more details about the Hilbre Bird Observatory see their website (www.hilbrebirdobs.blogspot.co.uk). The Dee Estuary Birding Website (www.deeestuary.co.uk) also covers Hilbre Island with daily bird news and a monthly newsletter. by Peter Williams of the Hilbre Bird Observatory. Hilbre Bird Reports, published by the Hilbre Bird Observatory. Allan Conlin and Steve Williams, Rare Birds in Cheshire & Wirral, CAW Birding, 2004.
www.hilbrebirdobs.blogspot.co.uk (Hilbre Bird Observatory website). Valerie McFarland, Barry Barnacal and John Craggs, Hilbre – the island in a wilderness, 1983.